Sadly, we are quickly approaching the last day of our trip, which is tomorrow. 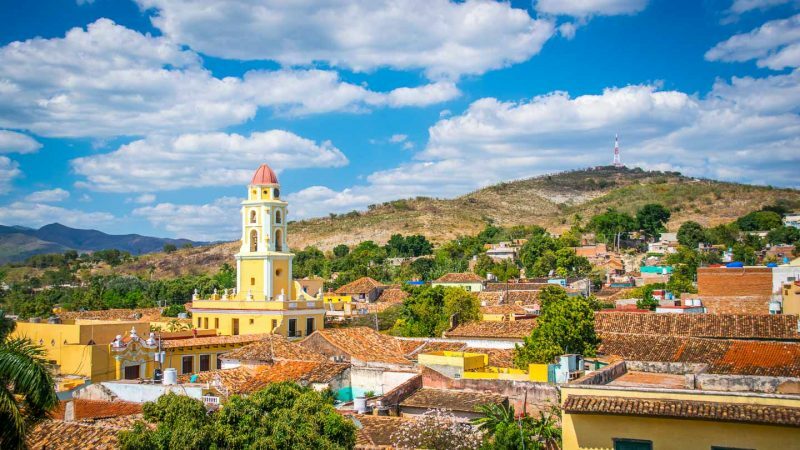 We still had today, though, and it was filled with much exploration in the beautiful and well preserved city of Trinidad on the southern cost of Cuba. When we arrived in the morning, the town was already bustling. Trinidad was built in 1514 and sits on limestone. It is a UNESCO World Heritage site, and after visiting there, I well understood why. The layout of the town is in the splendid Spanish style, with a central town square and churches and other buildings surrounding the square. Houses are typically just one story and have Spanish style clay, red tile roofs. The windows of the homes are decorated with ornate wrought iron. The streets are all of large cobble stones, causing them to be very uneven and difficult to walk on. The town was not always prosperous, however. In 1868, after the first war of independence against Spain, many of the sugar cane planters fled the area. Salt spray from the ocean severely affected the sugar cane plants, so production diminished. Then, abolitionists from England stirred up the slaves, causing unrest, which greatly affected the workforce needed to tend to the fields. Trinidad was abandoned for a period of time, but then revived in the 20th century. Much of the town is amazingly well preserved. After touring the town, we visited with Carlos Matta, a well-known artist from Trinidad, at his home. His home also serves as his studio, and is an 18th century Spanish style building, with a courtyard filled with green plants. An expert in historic buildings himself, he assists the city historian with restoration of buildings to ensure authenticity and accuracy. As in other areas of Cuba that we visited, a small band of local men gathered along the street to play music and entertain visitors. 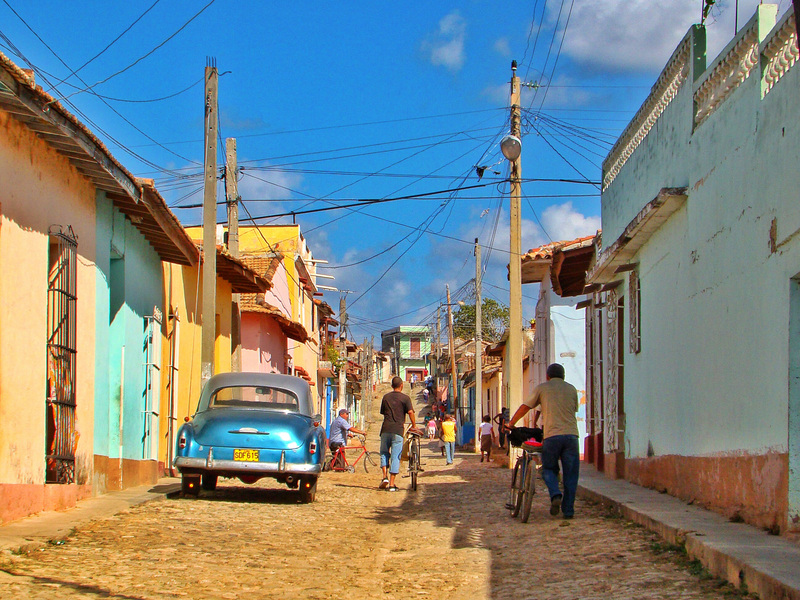 Music plays such an integral part in Cuban life, and they love to proudly share it with others. The Catholic church at the main town square was restored and has one of the few statutes of a seated Christ in the world. Catholicism in Cuba, and religion in general, were all negatively impacted by the Revolution. The Catholic Church lost most of its land and clerics who spoke up against the Revolution were expelled. People became afraid to worship or even make the sign of the cross in public. In 1992, the Cuban Constitution was revised causing a rebirth of religion. People were allowed to return to their faiths and freely worship. Today, approximately forty percent of the Cuban people are Catholics. Most of the churches have fell into disrepair and do not stay open for long hours, as in the U.S. When I travel, I enjoy visiting churches, but have not been able to do that here as I would like because they have been closed. Later in the afternoon and in contrast to the music of the street band, we were treated to a private concert by the Cienfuegos Chamber Orchestra, an eight-person group. They entertained us with a combination of Cuban symphonic and folk music. At the end, we gave them a rousing ovation. We were also able to meet them personally and learn about their background and training. They explained that to excel as a musician, a child should begin studying music at age 7, continue through high school, and then attend the competitive Institute of Arts. They currently have plans to travel to the U.S. to perform. We have one more day left in Cuba and it promises to be filled with activities involving the healthcare and educational systems. Every day has contained new discoveries in this vibrant country and I am looking forward to even more. Which U.S. Air Carriers Will Come Out On Top For Routes To Cuba?